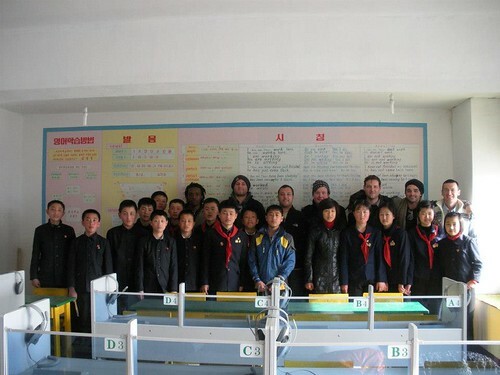 PennsylvAsia: Pitt student visits North Korea for spring break. Photo in a North Korean school's language lab, via the Young Pioneer Tours Facebook page. Guides for English study are posted on the wall. Many of the popularly-held beliefs that I took into the country turned out to be completely unfounded. For one, the average DPRK citizen is extraordinarily normal. They're not robots. They get through the day one day at a time and, just like us, have pride and support for their country. The biggest fear of the average citizen is being misrepresented in the global media. I had to admit it: the very notion of content and happy communists threatens the foundation of a capitalist society like ours. A couple of times, I was asked what the average American thinks of the DPRK. I was asked about my views of the government and the ongoing tension between our countries. We met up with one tour guide in Pyongyang. He said to me: "Evan, I know I'm from the DPRK; I know you're from America. But remember this: all around the world. . .children is children, life is life, and love is love." Over a few drinks, we agreed that nobody actually wants war. Everybody wants a peaceful world. I proposed a cheer to peace. We drank through the night. The Young Pioneer Tours Facebook page has more pictures and posts. For a couple takes on the latest North Korean situation---and especially on Western media's interpretation of it---written by expats living in the South, visit Roboseyo, Scroozle's Sanctuary, and the category on the topic at The Marmot's Hole. And for a thoughtful look at life in North Korea (and one with a local touch), former St. Vincent's College professor Richard Saccone's Living with the Enemy: A Year in North Korea is worth a read.